For three weeks, renowned Sydney DJ Kali (Picnic) joins Art After Hours, spinning a sweet soundtrack of disco and soul for the Modern Makers Workshop series. The mastermind behind local institution, Picnic Touring & Events, she has been described as Sydney club life’s saving grace. Hosting a weekly show on FBi Radio she has played at numerous festivals and events including Sydney Festival, Subsonic, Vivid Sydney, Astral People’s Summer Dance, Piknic Électronik (Melbourne) and Mad Racket. Kali is fluent in underground techno, house and disco, however her musical endeavours aren’t limited to after dark. Kali also oversees the music for numerous Sydney venues including Da Orazio, The Dolphin Hotel, Beach Beach Public Bar and Harpoon Harry as musical director. 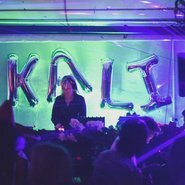 With extensive expertise at curating a good time, Kali promises an excellent selection of grooves to get those creative juices flowing.